This favorite Rakesh Jhunjhunwala stock set to beat Bitcoin? Grew 73,330.65%; do you own it? Rakesh Jhunjhunwala favourite stock Titan, in a year’s time, has more than doubled on BSE. Titan touched a low of Rs 522 per piece on July 27, 2017, and since then it has gained 92.72% on BSE by touching a high of Rs 1,006 per piece. If you want to make good money by investing in equities, you might to look at an expert’s way of investing. After all, their success can be a good learning story for you to profit from on stock exchanges. And who could be better than Dalal Street king, Rakesh Jhunjhunwala? Every equity lover is familiar with this name, and it wouldn’t wrong to say his investment techniques when it comes to equities, are commendable. However, investing in equities is a little like a gamble where, one should always remember, the investor is not pulling the strings - the stocks are driven by many things, including even sentiment. Therefore, you don’t want to make a wrong investment and later regret. One thing an investor should remember is that, investment in equities are best on a long-term basis if s/he wants to reap maimum benefits. And if the stock is chosen wisely, it can lead to a major success story and what’s better than learning from ace investor Rakesh Jhunjhunwala who has been in this field for a very long time and has turned it into a massive success. Jhunjhunwala has been called the Warren Buffett of Indian stock markets! Jhunjhunwala 58, is said to be one of the most successful equity investors in India, as he turned his investment of just $100, when he began trading, into a massive $2.9 billion. He belongs to a middle class family and began his first trading on BSE in 1985. Since then he has selected trading as a full-time profession. With such a long experience, for Jhunjhunwala making money from stock exchanges is seemingly, like a child's play. However, it should also be known, that he has mastered the word patience in stock market. That is a virtue that everyone in stock markets needs plenty of. Among many investment quotes of Jhunjhunwala, one that stands out goes like this, “Invest in companies which have strong management and competitive advantage.” This quote is best suited for investors who have invested in Jhunjhunwala’s favorite stock Titan Company, as this one is now seen as money making magnet in its sector and exchanges. In a year’s time, Titan has more than doubled on BSE. Titan has touched a low of Rs 522 per piece on July 27, 2017, and since then has gained by 92.72% on BSE by touching a high of Rs 1,006 per piece. This is better than the 31-scrip and 51-scrip indexes as well, as both Sensex and Nifty 50 have grown between 20% - 22%. On Friday, Titan finished at Rs 836.50 per piece above 3.42% on BSE. However, during the day, the stock has grown by nearly 4%. This has grown by 57.08% from Rs 534.6 per piece which stood on the same day of previous year. 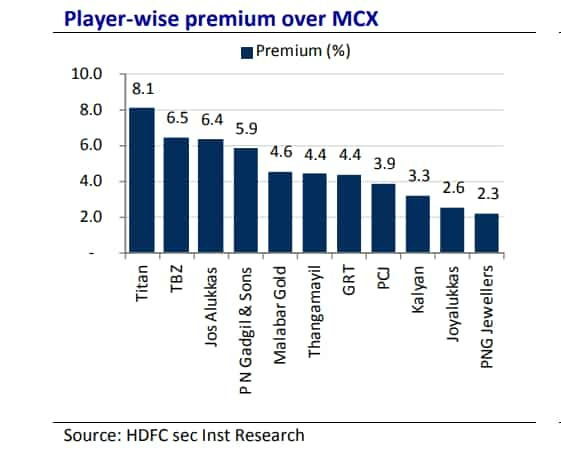 On MCX, Titan is at a premium of 8.1% compared to other rivals like Tribhovandas Bhimji Zaveri (TBZ) which stands at 6.5%, PCJ at 3.9%, Thangamayil at 4.4% and Kalyan at 3.3%. 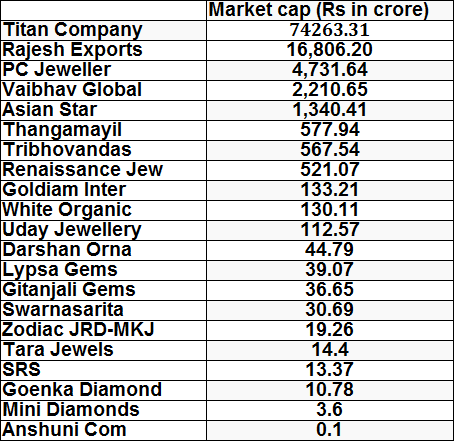 Not only this, Titan’s market capitalization is at Rs 74,263.31 crore as on July 13, 2018, which is like 2.71 times higher than the entire gems & jewelry stocks on BSE. A total 20 jewelry stocks excluding Titan holds a cumulative market cap of Rs 27,344.05 crore. Titan’s peers PC Jewellers has a market cap of Rs 4,731.64 crore, while Thangamayil at Rs 577.94 crore and TBZ at Rs 567.54 crore. Apart from Titan, only Rajesh Exports has a market cap of Rs 16,806.20 crore. According to HDFC Securities, Titan’s valuation is seen upto $11,711 million (which is approx Rs 8,02,164.85 crore) ahead. Not only this, Titan is the only domestic company which will take on global players like Tiffany, LUK Fook, Signet Jewellers and Chow Tai Fook Jeweller. Do you want to know a fun fact? Titan is a better success story than even Bitcoin cryptocurrency. Each coming day Bitcoin is losing its golden touch in the cryptocurrency market. Because of Bitcoin, investors have lost faith in other digital coins like Ethereum, Litecoin, Bitcoin Cash and Ripple. Bitcoin currently trades at $6,298.60 with a market cap of $108.02 billion. Interestingly, Bitcoin is just few billions away from falling under $100 billion market cap. The downfall of Bitcoin was as big and quick as its rise - it grew 141,825.71% or 1419.26 times by December 17, 2017 - to clock $19,869.60-mark not so long ago. If we compare to current market price of $6,298.60 with $14 in the beginning of 2013, this coin has now grown by 44,890% till now. But Titan has shown some promising growth. Titan has a lowest market price of Rs 1.37 in the month of October 2001, since then the company has grown by a behemoth 73330.65% or 734.30 times currently in a span of 18 years. Titan will grow furthermore unlike Bitcoin whose trajectory no one can predict efficiently, but considering that government after government is banning it, the direction is downward. Also one good comparison is market cap, Bitcoin now is near $108 billion, while Titan is seen to bag market valuation of over $126 billion if we look at HDFC's prediction. Earlier, ICICI Securities on Titan states, "We believe Titan’s growth story will remain multi-pronged and drawn over a longer time frame. Consequently, we shift to a DCF based valuation to arrive at a target price of Rs 1090 with a BUY recommendation on the stock. On a DCF basis, we assume revenue CAGR of 20% over FY17-23E and 11% over FY24E-30E with 10.8% WACC and 4% terminal growth rate." Rohit Harlikar and Jay Gandhi analysts at HDFC Securities said, "India’s jewellery story is mostly about the SUPERPACK (17 organized jewellery chains that will grab ~42% share in the next five years). The SUPERPACK has significant diversity – in current operations as well as growth strategies." The duo adds, "Titan looks like the big winner right now, but ‘DEFENCE’ will be the operating word as SUPERPACK closes in. Business gains are priced in." As per HDFC Securities, given the current design/capital arbitrage, we believe Titan will have a head-start on the customer acquisition race over FY18- 21E. Co is confident on achieving its aspired 25% jewellery revenue growth in FY19E. However, peer gaps will reduce post FY21 (Phase 2 of our medium term view) and Titan will find itself defending turf against very strong and able challengers across India. Jhunjhunwal's biggest holding is seen at Titan which is worth more than $900 million. He currently holds 8.46% in the company. Considering this you might want to thing about Titan as an investment option very seriously.